Chris Deegan finishes 1st 32km FINA Grand Prix in 7th! It was the 64th Annual Traversee de Lac St. Jean on Saturday, and Chris Deegan was representing PCS and his home country Australia in his first ultra-length Open Water Swim. 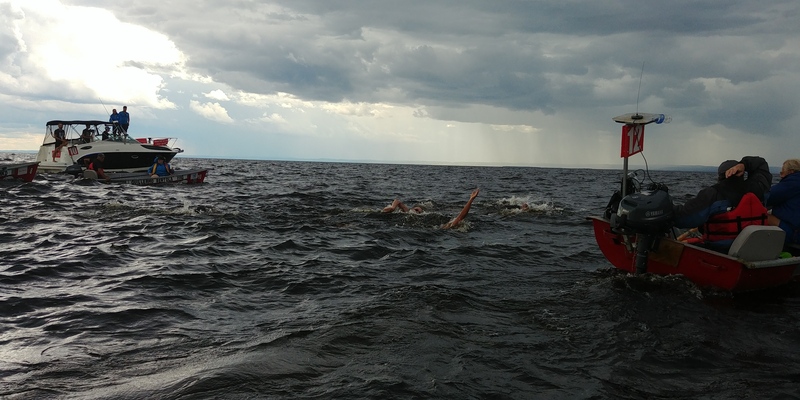 The 32km swim takes place in a lake crossing, one long swim starting in a river in the north of the large lake, and finishing in the south at the town of Roberval. After getting on the bus out there at 5:45AM, getting the suit on and putting on a thick mixture of suntan lotion, vaseline, and zinc oxide, the swimmers started their race at 8:30AM. I jumped in a boat with a nice driver, had a lot of gatorade, bananas, and a small white board to communicate with Chris, and went off to coach him for the next 7 hours. The race never had a moment of relaxation - it started at a very strong pace for such a long race with 2 guys breaking off out front and pushing the pace even further, there was a big storm in the middle of the race with 5 foot waves, rain and lightning, and it finished in a very close touch. Chris swam with the main pack at the start, and broke off with a swimmer from France and pushed their way to the front swimmers over the course of a few km's. The front back changed a lot throughout the middle 10km of the race - Chris twice dropped back from the pack and fought his way back into it and looked great, but in the midst of the storm, and after working hard to get back to the front pack, Chris wasn't able to stick with the pack. As the waves died down slightly, Chris found his form again and started gaining on a couple of the top-6 swimmers, but wasn't able to close the gap and finished in 7th. The race started with 15 guys, and as the least experienced, he did great to finish in the top half, especially in such a tough race.